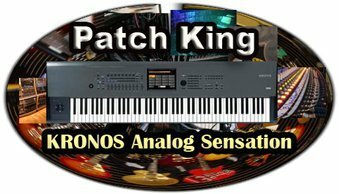 Korg Kronos Volume #8 – Analog Sensation contains the finest in virtual analog synthesis for Kronos AL-1. Only $39. USD. Analog Sensation includes a sonically rich and varied palette of diverse sounds that will make your tracks rock. Programs feature new basses, leads, pads, strings and a wide mix of new synth & rhythmic sounds using the powerful Kronos step sequencer. All programmed for easy tweaking, just the way you would on a vintage analog synth. Combi Mixes include a wide variety of styles that you can jam along with or use to spice up your rhythm tracks. Everything from Rock & Hip Hop to Dance & Funk styles that will get your head nodding and ready to jam! Analogue influenced arps, crunchy drum patterns, atmospheric keys and evolving pads all come together to give you that warm “analog sensation” that AL-1 is known for. Just load it in and get rocking!